Swing Set: Golf | Fit Families | Kids VT - small people, big ideas! Vermont's golf courses are only playable a few months of the year, but when the links are open, they're a glorious place to be. On a recent spring day, four lanky teenage boys are strolling along the verdant green of Rocky Ridge Golf Club's first fairway, their clubs slung over their backs. One of them is practicing for the Champlain Valley Union High School boys' golf team; the others are keeping him company and spending some quality time outside. It's a bluebird spring day, 61 degrees; the distant hum of cars is the only thing interrupting the hush that has fallen on this corner of St. George, near Hinesburg. The idyllic scene makes it hard to argue with Ed Coleman, Rocky Ridge general manager and head golf pro, when he proclaims back at the clubhouse, "There's no better place than Vermont to learn golf." Founded in 1963, Rocky Ridge sees its share of young players, Coleman says. Members' children play free until they're 18, and Coleman sees lots of grandparents with their grandkids on the course. The club offers junior memberships at a discount, but according to Coleman, kids should be at least 8 or 9 before they enroll in formal golf lessons — that's when they have the strength to swing a golf club properly. Until then, they should stick to mini-golf courses and driving ranges. Both are "extremely beneficial," he says. "The more time you have access to a club and a ball, the better. It's also fun!" Players ages 8 to 14 can enroll in Rocky Ridge's summer academies. "We break it right down to the fundamentals — grip, stance, posture, alignment, swing," Coleman says. The basics aren't difficult to learn. "We take them from hitting ground balls to hitting wonderfully struck golf shots, sometimes on the first day." The kids pick up more than technical skills. "When you spend four hours out there with friends," he says, "you develop attributes such as honesty and courage. 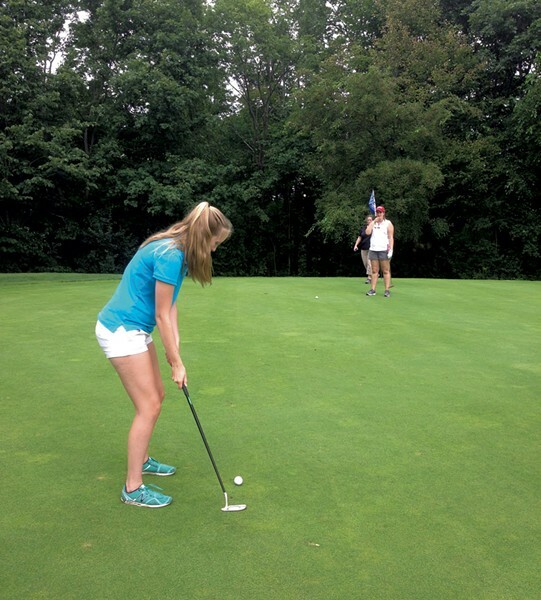 There's a lot of positivity and resiliency — golf can be a tremendous asset to a young person's development." During the past 10 years, Coleman adds, golf companies have made major advances in developing junior equipment, which makes the game even more accessible for kids — and surprisingly affordable. A new set of clubs costs between $150 and $300, with better bargains on used sets. Tee time doesn't have to break the bank, either. While elite players flock to pricey private clubs, the Green Mountain State is home to a number of public-access courses such as St. George's Rocky Ridge. Some of them are on former dairy farms, whose affable owners have turned the pastures into putting greens. At these public clubs, the cost of an unlimited-play membership is comparable to a season ski pass — cheaper if you've got a kid tagging along for free. Nonmember greens fees at Rocky Ridge range from $22-$42 per player, depending on the time, day of the week and number of holes. Coleman points out that kids who've learned golf often return with their friends, parents or grandparents. "It's a mutual learning environment," he says. "You always come away with a smile on your face." Rocky Ridge is located at 7470 Route 116, St. George. It's open seven days a week, from 7 a.m. to sunset, now until mid-October. Find more information about membership, tee times and the summer youth academy on their website.